If you are shipping to India from USA and paying for your own move, ’Less Than a Container Load (LCL)’ is an affordable way to ship your belongings in small quantities such as some boxes, 1 or 2 TVs and even some furniture. 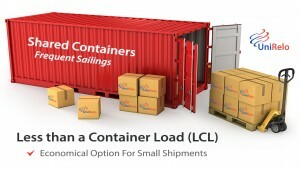 Typically, LCL shipping to India requires a minimum volume requirement of only 50 Cubic Feet (around 8 – 10 boxes). Your boxes are stacked up & wrapped together on a 48″ x 40″ wooden platform called a pallet in a warehouse facility before being loaded into an ocean container. Also known as shared container shipping, the LCL option is the way to go if you are not shipping everything in your house. LCL is usually cheaper than a Full Container Load (FCL) if you are shipping 500 Cubic Feet or less. Keep in mind that LCL Shipping to India takes longer than shipping as FCL due to the waiting time involved in consolidating shipments at the warehouse. UniRelo can pickup your LCL shipment from anywhere in USA and deliver it to your home in India. Feel free to call or email us at info@unirelo.com to learn more about Shipping to India as LCL and for a free rate quote.